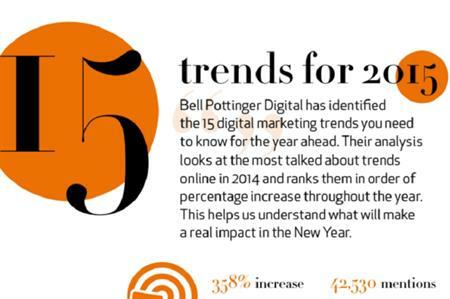 Communications firm Bell Pottinger has predicted the 15 top digital trends that will change the way brands communicate in the New Year. The analysis was undertaken by Bell Pottinger Digital, the group’s digital consultancy (previously Bell Pottinger Wired), and captures the most talked about trends online in 2014, ranking them in order of percentage increase throughout the year in a fun infographic. Other trends on the list include, branded content, beacons, big data, augmented reality, 3D printing and gamification. See the full infographic below. James Thomlinson, partner and managing director of Bell Pottinger Digital, said: "While technology will be one of the biggest drivers of marketing change in the New Year, the key focus for brands will be on delivering truly integrated strategies. "Every year new hardware and software appears, but the most successful brands in 2015 will be those that harness new technology to deliver a single experience to consumers wherever they are in their journey," he added.